A recent study by Semiocast has revealed that while the US leads with the most number of Twitter accounts, currently standing at 107.7 million, the Netherlands has the most active users. Analyzing 383 million Twitter user profiles that were created before January 1st, 2012, Semiocast determined that US Twitter users account for 28.1% of all users, while Brazil snagged the second spot with 33.3 million accounts, ahead of Japan with 29.9 million. According to Semiotic’s statistics, December saw the US add 5.6 million accounts to Twitter in just one month. The top 5 list is completed with the UK in fourth place with 23.8 million users, and Indonesia is in fifth place with 19.5 million. The top 10 also list includes India, Mexico, the Philippines, Spain and Canada. While a lot of statistics are bandied around about the number of users on Twitter, and about the social network’s growth in general, it’s far more interesting when it’s taken in context of how active those users actually are. While Brazil has more accounts than Japan, the latter is more active. In the period from September 1st to November 30th, 30% of Japanese accounts posted at least once, while in Brazil the number slipped to 25%. For both countries, the number is surprisingly low, meaning that at least 70% of those millions of accounts were dormant for at least 3 months, if not more. 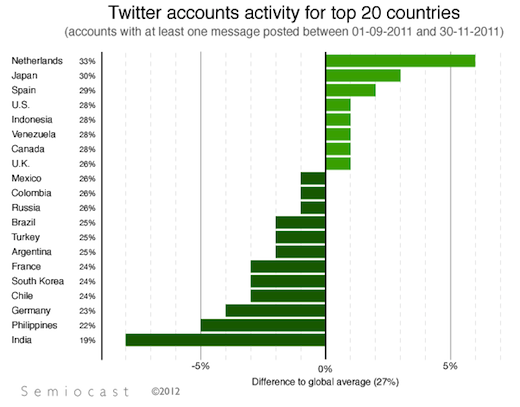 Globally, that percentage sits in the middle at 27% of all accounts posting a tweet in the 3 month period. The country with the highest percentage of active accounts is the Netherlands, with 33% of the accounts posting in the 3 month period. 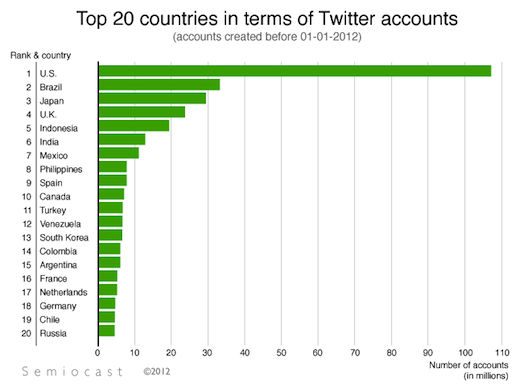 Aside from Japan and the Netherlands, the 5 most active countries on Twitter include Spain, the US and Indonesia. Taking into account other forms of activity on Twitter, such as following other users or changing a profile picture, the Netherlands is also above the global average for activity, with at least 52% of users actively using Twitter during the 3 month period in one of those ways. The global average is slightly lower, standing at 48% of all users. This highlights the fact that a vast number of Twitter users are choosing to use the social network to consume information, rather than share it, reinforcing the idea that a small percentage of Twitter users are the ones who are producing most of the shared content.